That magnificent creature above is a Birgus lato, or a coconut crab! Coconut crabs are quite the delicacy in Vanuatu. Before my trip, I'd heard of Vanuatu's famous coconut crab, but I assumed that it was a way of preparing crab, not an actual species. D'oh! 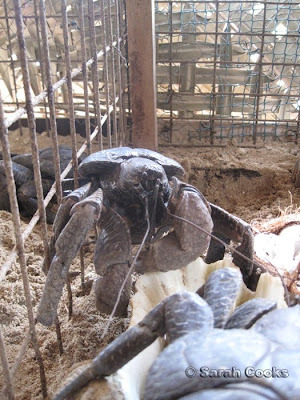 These crabs are called coconut crab because they eat coconut! 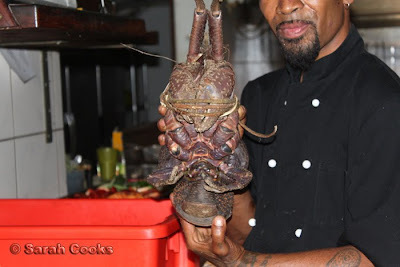 When I was in Vanuatu, coconut crabs were available in many restaurants but - gasp! - I never ate one. There were 2 reasons for this. First, they're endangered! 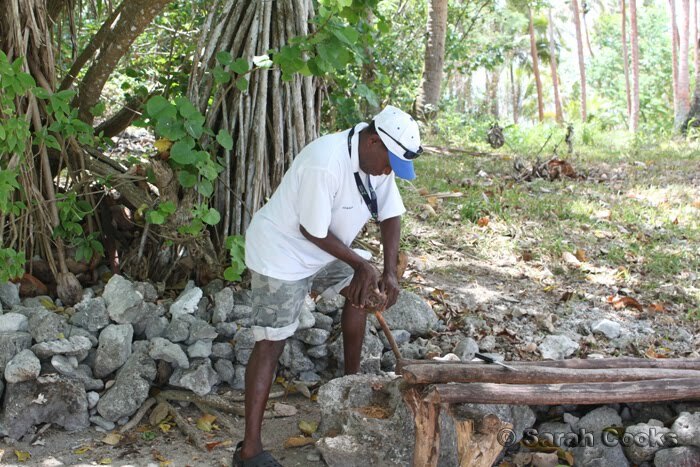 Apparently sometimes the Vanuatu government places restrictions on harvesting, to protect the population. No bans were in place at the time, but I did not feel comfortable ordering them. And second, they are one of the freakiest creatures I have EVER seen. 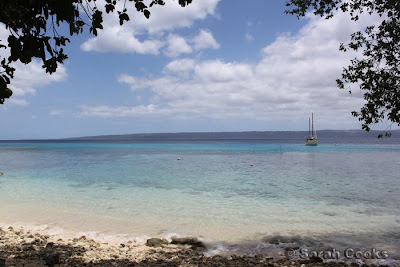 During our trip, we went on a (rather disappointing and expensive) "river kayak" tour, at Blue Water Island resort. The website makes the resort look shiny and new, but in reality it is very tired and old - our tour guide (who was lovely!!) told us there were no guests at all. It's half an hour out of town, in the middle of nowhere, and it felt like it was on the verge of repossession. I'm not sure if it was because of the poor location, or maybe the owners just stopped caring. They did have some cool stuff though, including pools where you could feed reef sharks and beautiful big turtles. 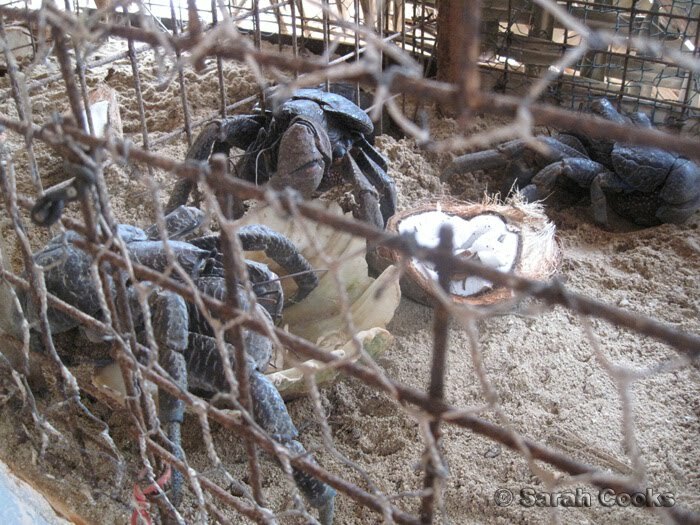 And a couple of cages of coconut crabs! Argh! It looks like a massive creepy spider! Check out those massive claws. The coconut crab climbs trees to eat coconuts or fruit... Coconut crabs cut holes into coconuts with their strong claws and eat the contents; this behaviour is unique in the animal kingdom. It was only a couple of days later, on a much better snorkelling tour to Paradise Cove, that we realised just how strong those freaky coconut crab-claws must be. 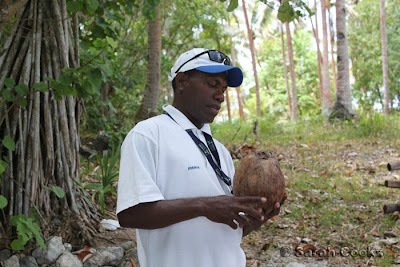 Part of our tour included a coconut demonstration, where our tour guide broke down a coconut. ...and he uses a lot of strength to pry the husk away from the coconut. 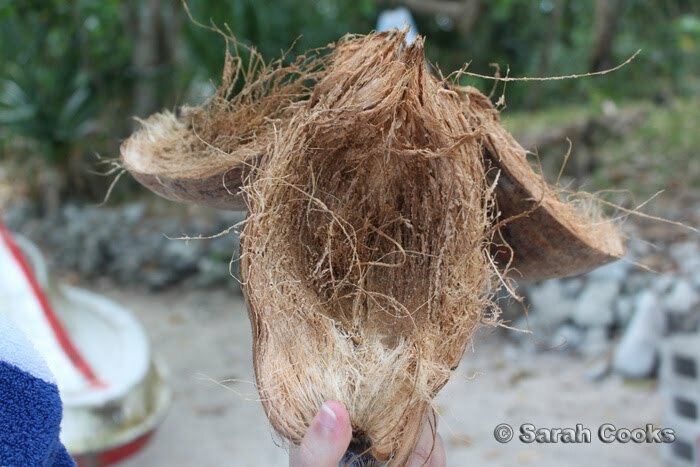 Apparently the husk is used in many ways - for toothbrushes, as bedding for chickens, for kids to play with as little sailboats, to make bags and more! ... and we can all feast on the sweet coconut within. It took him about 10 minutes all up, using a lot of strength and a sharp stick and rock. 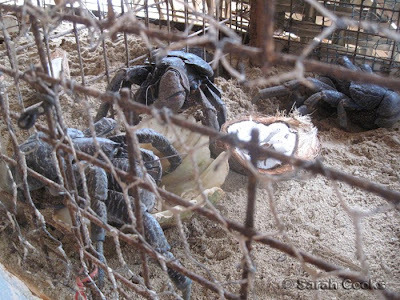 And these coconut crabs can do it WITH THEIR CLAWS!! I remember watching an episode of Anthony Bourdain's No Reservations where he ate coconut crab. He said it tasted amazing, but there was no mention that it was an endangered spieces. I think you did the right thing by not eating an endangered spieces. I like to think that if I was in your shoes, I'd do the same thing. Fascinating! I never heard of coconut crabs. They must have some strong claws all right. There is a coconut crab (long dead) mounted in a display of crabs in the museum in Suva, Fiji. When I was a kid of about 7 or 8, that very crab chased me across the lawn by the pond in the neighbouring botanical gardens in Suva, when the gardeners fished it out of the water. It scared me almost to death, and after it was killed and preserved, I used to go into the museum just to confront it and get the last laugh! That is the scariest thing I've ever seen! I like crab generally, but I'd be waay freaked by those huge claws (though imagine how much meat must be in them!) Yeah I try to stay away from everything endangered as well although I was once lured into ordering a Patagonian toothfish only to find out from Meliie of Tummy Rumbles that it's endangered. Boy is my face red! for a deeper understanding of the issue. PS: they taste very bland hence restaurant chefs covere them with sauces to give them flavour. Hi everyone - yes they are indeed freaky looking! John - I wanted to see what the famous coconut crab tasted like, but my conscience wouldn't let me. 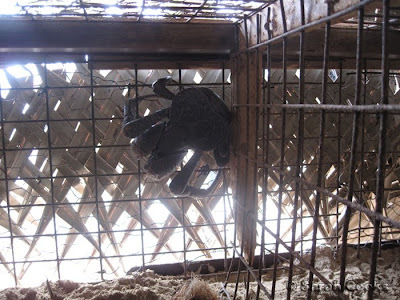 Interestingly, most restaurants/hotels that I visited in Vila served the coconut crabs and recommended them to us. The only restaurant I went to that wouldn't serve the crabs was The Waterfront. They explicitly stated on their menu that they were endangered! I had eaten a coconut crab once and it tasted good even if it is freaky. I am glad to hear that those endangered species are now being protected. Looks like I have to revitalize the issue to the restaurants, mind you there are a lot of new ones and the owners may not be aware, also chefs change and new ones arrive from overseas so they want to distinguish themselves with a "exotic dish" on their menu. In response to Cathy: Yes there are plenty around, depends how you quantify this. To some there are plenty of Koalas around in Australia...untill the next bushire and suburbian expansion. Coconut crab is amazing. Better than any lobster and so much meat. We ate lots when we lived in the Marshall Islands. Haven't had one in 20 years and likely won't go back. Good point - I'm sure many of the chefs and restaurant owners in Port Vila or other parts of Vanuatu are newly arrived or expats, so might not be aware of the situation! 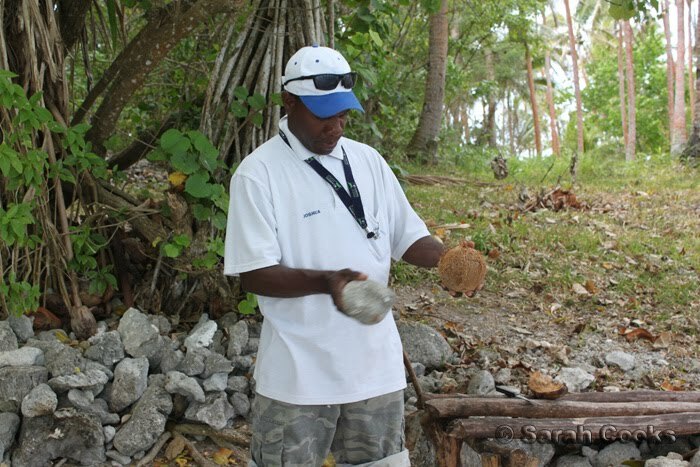 I believe Catty said there are still plenty of coconuts around, not plenty of coconut crabs! I sure did eat lots of fresh coconuts in Vanuatu! Love drinking fresh coconut water, yum yum. 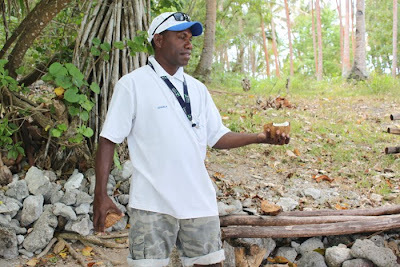 Good on you for bringing this issue to the attention of the tourism industry in Vanuatu - I was sad to read the crab sanctuary at White Grass Resort in Tanna got closed down by the new owners. 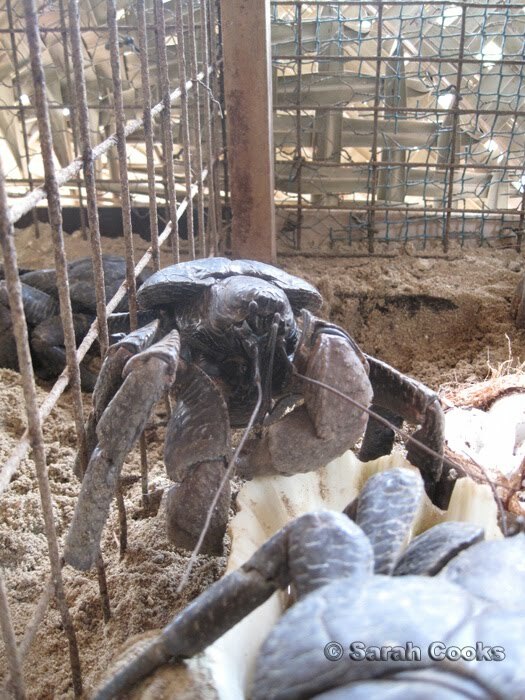 I first read about the coconut crabs after I saw the series on Anthony Bourdain. Yah just the kind of creature I would expect to be eaten into extinction. Anything that lives that long and takes that long (60 years) to get there is in danger. Its so weird. Reminds me a bit of the Dodo and look what happened to them. No I wouldn't eat one either. Land crabs are not as sweet nor as tender as sea or water crab anyway and sometimes can be toxic due to their diet. They can and do consume poisonous fruits that dont harm them but can kill us.... you never can tell what their last meal was. Maybe that's why they keep them in cages and feed them on coconuts. 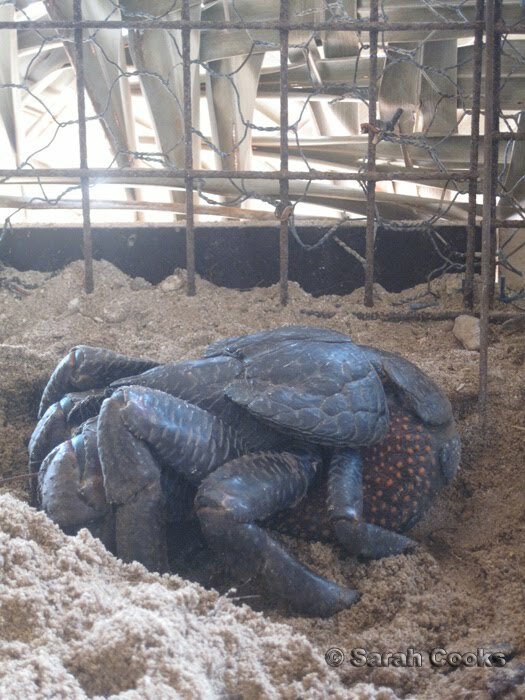 There are restrictions in some parts of the world/islands where only males of a certain size can be eaten, but when you think females need males to fertilise their eggs also not the most clever strategy to conserve these magnificent Arthropods that are already extinct in most places where they cohabitated with or near man.